On the heels of its wildly successful debut release, Almost There, and radio single, “I Can Only Imagine,” MercyMe is back with a second helping of acoustic-driven hits on Spoken For. While the group’s previous indie projects tended toward a rock rhythm that was occasionally woven into Almost There, this time around the group leaves all signs of rock behind. W ith frontman Bart Millard’s crystal-clear voice complimenting acoustic-driven tracks so perfectly, this wasn’t such a bad decision. Album standouts include the beautifully arranged title track, which offers a look at Jesus recognizing His children at heaven’s gate, and the driving ballad, “Crazy,” which explores the merits of heaven over earth. “The Change Inside of Me” and “All the Above” contain great hooks and are firmly rooted in the pop side of adult contemporary music. While not a perfect sophomore effort, as the group occasionally sways to the triteness so often found on AC/pop projects, MercyMe has progressed in musical focus, songwriting and vocals. Used by permission. CCM Magazine © 2002 Click here to subscribe to CCM Magazine. 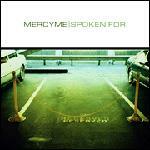 Buy Spoken For now at www.lifewaystores.com!